Just as in Brunsbüttel, a total of four lock chambers are available for shipping in Kiel-Holtenau – again, at least in theory. Also here the two chambers of the ‘Big Locks’ dating from 2014 are the most important ones for commercial shipping – most vessels (bulkers, feeder container ships, tankers, etc.) are today too big to transit the ‘Small Locks’ dating from Kiel Canal’s inauguration back in 1895. 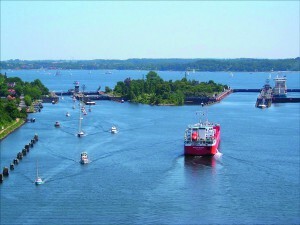 Continued use over a century has significantly affected the condition of the locks at Kiel-Holtenau, and the infrastructure here is – just as in Brunsbüttel – badly in need of a refurbishment in order to avoid significant impacts on the availability of Kiel Canal. Just as in Brunsbüttel, customers are unable to anticipate and plan delays and waiting times caused by the aging lock infrastructure. This, in turn, has a negative impact on the competitiveness not only of Kiel Canal, but also of the German ports, in particular Hamburg. …a thorough overhaul and upgrade of the ‘Big Lock’ chambers at Kiel-Holtenau. Bearing the long construction period in mind, this project has to be initiated soonest possible. Respective staff and financial resources have to be made available.